If I had to guess, I would probably say quinoa isn’t your “go-to” grain of choice. And, who could blame you? 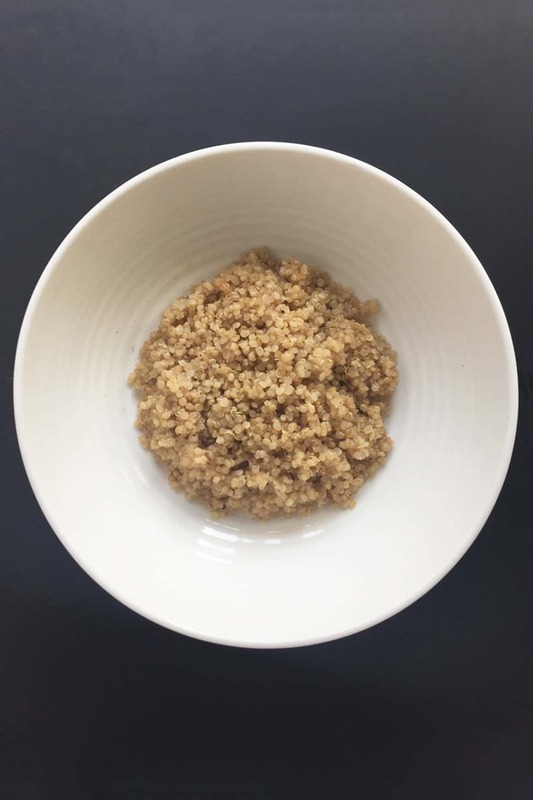 Quinoa, on its own, can be a little bland and not very exciting. But, add a few things into the mix and you’ve got a rock concert of flavor, nutrition, and satisfaction! 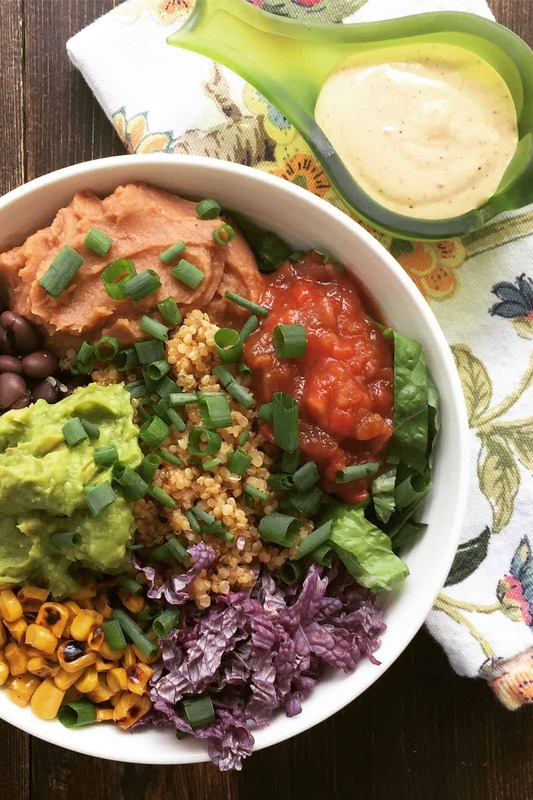 This Quinoa Chipotle Bowl with Southwest Tahini Sauce is super tasty and will forever change the way you look at this ancient little grain. This recipe was the result of me just being lazy and throwing whatever I could find into one bowl for the sake of convenience. The results, however, were amazing. Not to mention, I had a pleasantly surprised wife and kids who demanded this concoction become a regular in our weekly meal rotation. 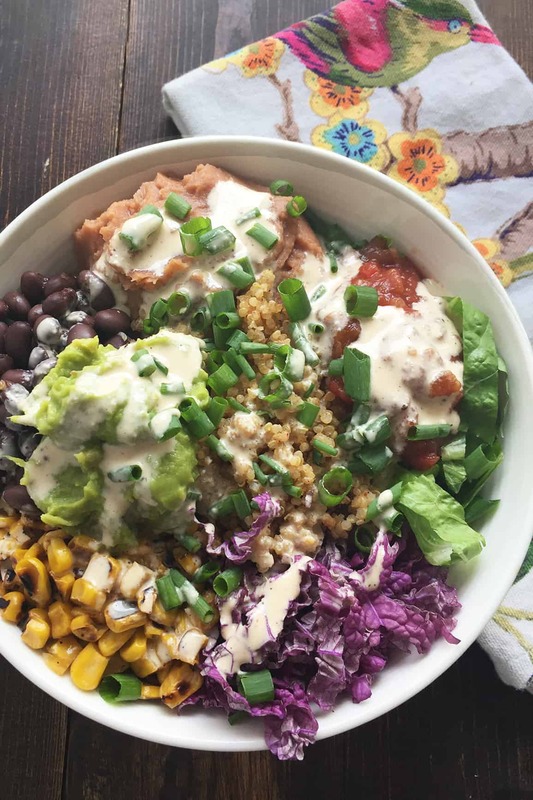 The combination of roasted corn, guacamole, salsa, and tahini dressing absolutely make this dish. 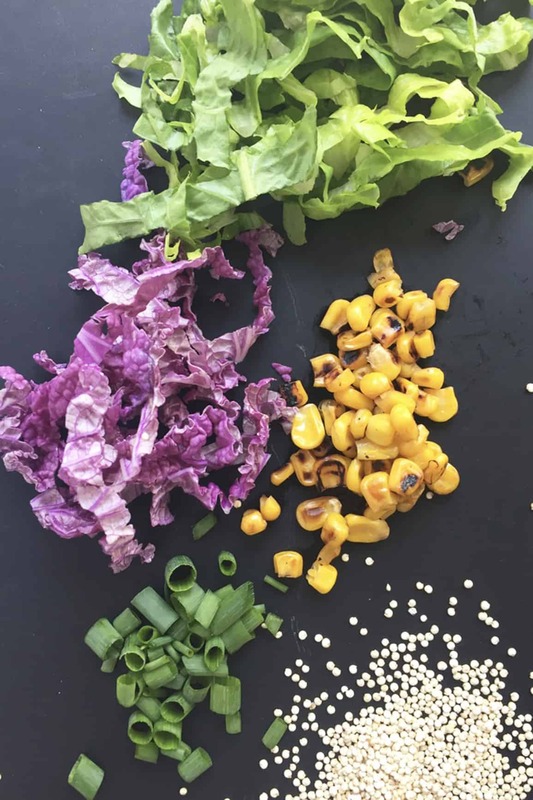 The greens and red Napa cabbage not only make this dish look, eh hem…pretty, but add a crisp freshness and include very vital nutrients so don’t exclude them. Let’s also not forget the time and effort that goes into preparing this tasty little master piece is on the minimal side. Once again…you’re welcome. This would make a great meal for a dinner party or family gathering. I think it’s something that will satisfy even those who do not adhere to a plant-based diet. You can also switch out the quinoa for another grain of your choice. Let me know if you try this recipe! Leave a comment, rate it, and tag your photo #shaneandsimple on Instagram! I’d love to see your take on this. And, as always, I’d really appreciate it if you would tell your friends and go here and SUBSCRIBE to Shane & Simple. Adios, friends! Place all ingredients into a bowl, assembling or layering however you choose. Combine all ingredients into a small mixing bowl or dish. Whisk until smooth and creamy. Add water for a thinner consistency, but I like mine on the thicker side. Amounts listed are mere suggestion and my personal preference, but feel free to adjust to fit your own personal taste. Cook time is assuming you have not cooked the quinoa. 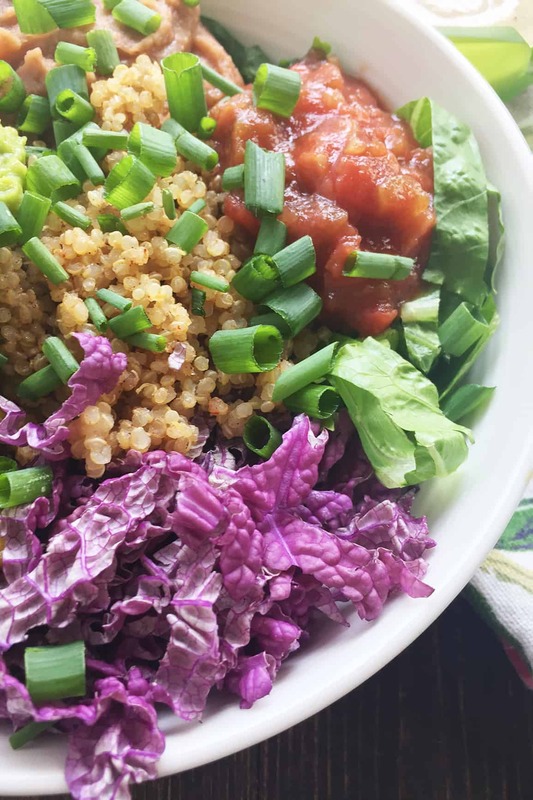 Quinoa is something you can cook ahead of time and store in the fridge for about a week. I like to add chili powder, cumin, and smoked paprika to the quinoa while it’s cooking. 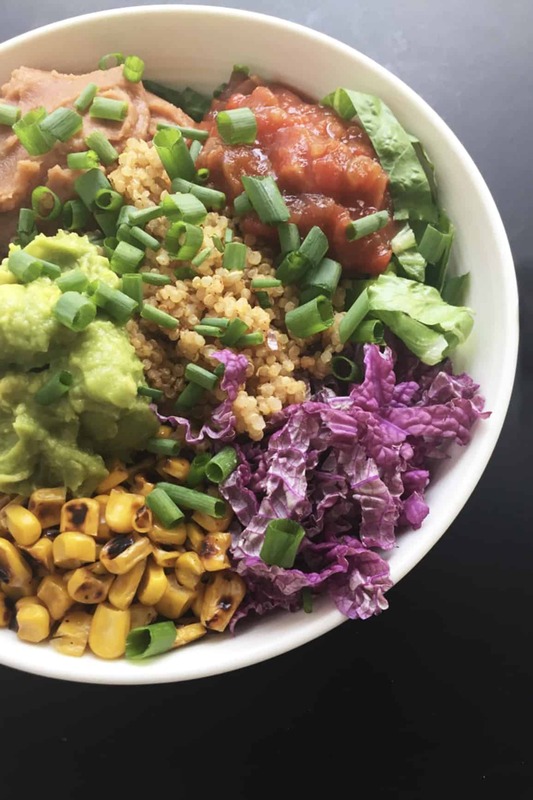 It adds another great layer of flavor to this already delicious bowl. This looks great! I love the idea of making the quinoa ahead of time – intentional leftovers are the best on busy weeknights! ? Thanks, Bet! And, yes, they are. Hard to believe I used to hate leftovers…now, I live for them:) Thanks for reaching out! Thank you! I was trying to figure out what to do with left over quinoa! Now I know what’s for dinner tonight. Awesome, Deborah! If you make it, leave me a message on how it turned out. I welcome the feedback. Blessings! This is an awesome dish…thanks for the recipe!! I made a couple of substitutions to accommodate for ingredients that I had on hand. Will definitely make again. Awesome! These recipes are merely to “get people going.” Love the creativity and using what you have, that’s what it’s all about. Thanks for the response! Hi Shane! It’s Joy from Madison, MS and now a transplant in Rochester, NY. Your blog is amazing, congratulations; I am so happy for you and your family! 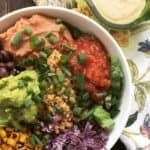 I’m trying to move back toward a WFPB diet after straying off it for a couple of years and your recipes have been such a huge help and inspiration. Even though my husband and kiddos aren’t on the diet, we all LOVED this recipe and plan on adding it to our rotation. I can’t wait to try all of your recipes. Thanks for sharing your journey, Shane! HEY, JOY! Rochester? Wow! Thanks so much for touching base and following. All the best in your journey. Peace. American chilli powder must be different to what we have in Australia – a tsp would make it too hot to be edible.